SYNOPSIS: Russia, 1910. Valentina Ivanova is the darling of St. Petersburg's elite aristocracy-until her romance with a Danish engineer creates a terrible scandal and her parents push her into a loveless engagement with a Russian count. Valentine struggles to claim her own independence. But at the same time she is desperate to protect her young sister from the dangerous tumult that is sweeping through the city. Author Kate Furnivall has written an utterly engrossing story of Valentina Ivanova, a daughter to the finance minister to Tsar Nicholas II, set in St. Petersburg during a time of great civil unrest in Russia’s history. The working class and poor are getting more desperate every day as they fight starvation and disease or get injured, maimed or killed at the un-safe factories they are forced to work in while the upper class grow more rich and spend more extravagantly. The Revolutionaries are killing off government officials left and right and Valentina’s father is among the targets. Valentina, though born in the upper class, is more interested in taking care of people than of dresses and parties and dreams of one day becoming a nurse. She is a bright, strong-willed girl whom I liked immediately and the rest of the characters were just as engaging - the endearing engineer, Jens; Arkin, the Revolutionary with a heart, Valentina’s sad mother Elizaveta and her unfortunate sister Katya. With exceptional descriptions of 20th century St. Petersburg, from the opulent homes of the Russian nobility to the squalid homes of the working class and the underground tunnels beneath the city, Furnivall draws the reader in and the fast-paced action keeps you flipping the pages quickly to see what happens next. Having thoroughly enjoyed my first book by Kate Furnivall, I am now on a mission to own them all! If you like your historical fiction exciting and unputdownable, then this is the book for you! Valentina’s story doesn’t end here, check out The Russian Concubine , which is the sequel to The Jewel of St. Petersburg and tells the story of Valentina’s daughter. 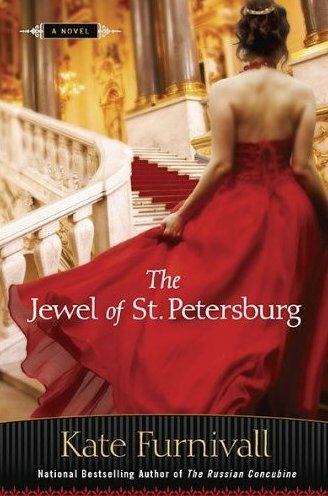 Now that I've hopefully whetted your appetite and you're dying to read The Jewel of St. Petersburg ...here is your chance to win a free copy! A big thanks to Penguin Publishing for providing Passages to the Past with 1 giveaway copy. To enter, please complete the form below. This giveaway is open to US and Canadian entries ONLY. Giveaway ends on August 16th. Earn 1 extra entry if you help spread the word by posting, tweeting or Facebooking about this giveaway. I have The Russian Concubine, but I didn't know there was a prequel to it! Great review. I am so glad that you enjoyed this book so much! I loved The Russian Concubine when I read it, and also really liked the Under a Blood Red Sky. Really looking forward to reading this one, and the next book already sounds very interesting from what I have heard. Ooh, glad you enjoyed this one so much! I received it unsolicited and haven't read anything by Kate Furnivall, so I put it on the "to see later" pile. I'll have to move it back onto the TBR pile after your review! This book sounds awesome! Great review, Amy! I'll be reading this one later this year (I couldn't fit it into my review schedule for a few months) so I"m glad to hear it's a good one! Amy, you really make this novel sound irresistible!!! I love your wording "unputdownable"! I love reading books set in Russia and after your fab review, how could I not read this one??? Thanks for recommendation and contest OG! This sounds really amazing! I have The Russian Concubine in my TBR. I know you said this is your first book of hers you have read but would you or anyone else who has read either book suggest reading The Jewel of St. Petersburg first? Or do the books stand alone? I will also check Furnivall's site but would appreciate reader input. So glad I discovered reader blogs earlier this summer (although my TBR pile and wishlist are having growing pains)! Thank you! this one looks so good! Thank you for the giveaway -- I am so excited for this book! Thanks for you kind offer. This is a new genre for me but the covers are so beautiful and the stories sound so good that I'd like to give it a try. Lovely cover. Times of political upheaval and violent revolution offer many opportunities for stories of love, loss, danger, and heartbreak. I would love to be entered in your giveaway for this book. I've read "The Red Scarf" by Kate and really enjoyed it. Her newest looks really good. Thank you for the entry. Great review! There doesn't seem to be many Russia based historicals, in my opinion. Thanks for the giveaway! I hope I haven't already entered! Oops, I double entered -- I'm sorry about that!